Added wild-card functionality to serial sets to help support XDS receivers and other triggering. Added custom termination characters for serial to help support XDS receivers and other triggering. Added “Rising-Edge Sentinel” function for Broadcast Tools devices to ensure triggers are only triggered on initial rising-edge of trigger signal. IMPORTANT NOTE: Customers using any earlier version of Simian (i.e. 2.2.2, 2.1.3, 2.0.7, 1.7.9, 1.7.0, 1.6.0, or 1.5.17, or 1.4.0 etc will require new validation codes (these are free of charge to customers with a Valid Tech Care Plan) to upgrade to this version. IMPORTANT NOTE: Customers using any earlier version of Simian (i.e. 2.1.3, 2.0.7, 1.7.9, 1.7.0, 1.6.0, or 1.5.17, or 1.4.0 etc will require new validation codes (these are free of charge to customers with a Valid Tech Care Plan) to upgrade to this version. IMPORTANT NOTE: Customers using any earlier version of Simian (i.e. 2.0.7, 1.7.9, 1.7.0, 1.6.0, or 1.5.17, or 1.4.0 etc will require new validation codes (these are free of charge to customers with a Valid Tech Care Plan) to upgrade to this version. IMPORTANT NOTE: Customers using any earlier version of Simian (i.e. 1.7.9, 1.7.0, 1.6.0, or 1.5.17, or 1.4.0 etc will require new validation codes (these are free of charge to customers with a Valid Tech Care Plan) to upgrade to this version. New option to hide the main decks and expand the Program Log. Useful for Production Mode or small monitors. Macro name auto-fill feature in the Event Builder (start typing a macro name and it’ll complete it for you). New option in the CHAIN macro can load a specifically named log, or a default log if the macro is unable to find the specified log. That means that you can create default logs so that if somebody forgets to import a log, there is a fall-back log that will be loaded instead of re-loading the previous day’s log (though that is still possible, too). New options to resolve carts in your program log before playback, including automatic options when loading and unloading a program log and a RESOLVECARTS macro allowing you to resolve carts on-the-fly. 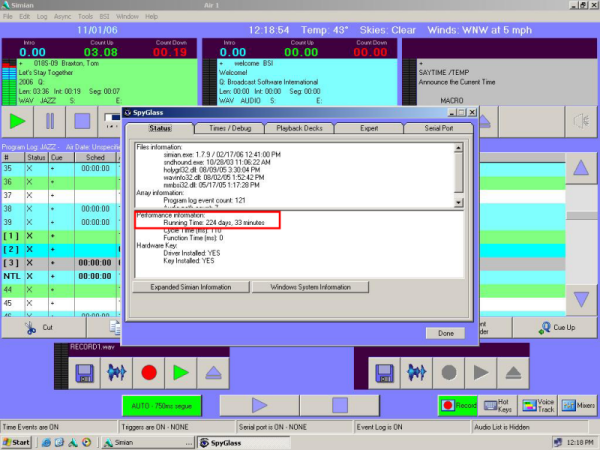 This feature is useful for users whom want to explicitly know what is going to play from the log at air time, and for using the BackTime feature with carts of varying length (since the carts will be resolved to their component events, the BackTime function can exactly calculate the playback length of all events). Resolves all cart types including randomized and non-randomized carts, carts with AutoStart events, and date and time windowed carts. PLAYHOOKS macro can now optionally include an audio file with the artist’s name before each hook is played. Improved Program Log and Audio List pop-up scroll display. Improved Drag-N-Drop functionality of the Program Log and Event Builder. More date meta-variables in macros: Now you can use +1 through +9 and -1 through -9 for many date-related macro variables so you can use dates up to 9 days in the future or 9 days in the past. New option to convert date meta-variables in the file names in your program log either when the log is imported based on the air date of the program log, or on-the-fly in real time when a file is loaded while airing the log. More customizable user interface colors: Now you can change the colors for audio file types, the program log, and cart builder in addition to the main user interface background (see picture at right). New feature to automatically fill the scheduled time field for all auto-start events in the program log based on the length of the audio files and the timed events in the log. Deck scrubbers now available when FlexTime/BackTime enabled. Upgraded BackTime/FlexTime function to Time Scale (TSX) or Pitch Up/Down to .01% accuracy. New troubleshooting and expert options in the built-in SpyGlass diagnostic utility. Added function to check for ! cued items in the log, if none are found all BackTime/FlexTime calculations are disabled to free the processor. SAYTIME macro can now utilize a tail.wav (or tail.mp3) audio file. New option to treat BackTime cued events as timed events. If the maximum or minimum speed percent allowed is less than what is required, your BackTime event will fade the currently playing element out. Moved Weather info from the time field to its own field. Clicking weather on Simian’s main UI will now pop-up the weather info window. Added customization options to the weather functionality to allow user configuration of which weather info is to be displayed at the top of Simian’s main UI. Added SpyGlass option to delay creation of HTML file and output of metadata and streaming data by a specified length. Various UI improvements including new VU meter graphics. Scheduled Events can now use wildcards! Set a single Scheduled Event to run every hour, every 10 minutes, every minute (see picture at right). Added option to display metric units in weather info instead of US units. Added optional conversion of US weather data to metric. Exclude categories can now be used not only for the HTML generator, but also the Windows Media Encoder output, MetaData (PAD/XML via TCP/UDP) output, and Streaming (HTTP Call) output. Added default artist, title, and URL fields for Metadata, Streaming data, WME data output for excluded categories. New IFNOTEXCLUDED macro allows you to run macros, apps, or play audio files in the Async deck if the currently playing item in the main decks is not in an exclude category. This macro is especially useful for use in conjunction with the SERIAL macro when sending artist/title info to your RDS encoder. Various UI improvements including new record and playback deck graphics. Many new automation macros, including METADATA, SEGUE, SERIALPORT, STREAMDATA, TRIMFILE, UPDATEDESCRPTIONS, and an improved CHAIN macro. Ability to output song and title data directly to your favorite stremaing application via HTTP calls (“Streaming Data”). Ability to output song and title data via TCP or UDP packets (PAD/XML) (“Metadata”). HTML Generator now allows 2 independant HTML/Text files. PASSIVE mode is now supported by the FTP macro, increasing its compatibility with more types of webservers. Added ability to run macro commands directly from the Event Builder via “Run” button. Added ability to change the main user interface background color. Set No Fade at Segue tag when using the RECORD macro. Colored Status Bar Panels: The Status Bar now has visual indicators for their current status. New Macro descriptions and improved layout within the MACRO tab. Added meta variable options to the CHAIN, FILECOPY, FILEDELETE, LOGLOAD, RECORD, INSERTLOG, IMPORTLOG, and FTP Macros including dynamic dates (month, day, year, etc.) and days (today and tomorrow). See Simian 1.8 manual for full details. Air Date auto detection from Program Log filename now supports 6 or 8 digit filenames. New Automatically Adjust Log Display option on the Window menu which resets the Program Log Column Widths. <!–BSICOPY–> and <!–BSICATEGORY–> HTML tags added to Simian’s HTML page generator. Tools|Weather Info function updated to conform to the new NOAA weather forecast data format. IMPORTANT NOTE: Customers using existing versions of Simian 1.7.0 do not require new validation codes. Customers using any earlier version of Simian (i.e. 1.6.0, or 1.5.17, or 1.4.0 etc will require new validation codes (these are free of charge to customers with a Valid Tech Care Plan). Most reliable version of Simian yet – our in house tests of Simian 1.7.9 have been running for 224 days non-stop (previous record 150+ days). Extensive internal testing using our custom configured Dell GX620 PCs and rack-mounts using our recommended AudioScience sound cards re-affirms Simian’s reliability prior to full public release. New QUICKSTART Help – re-written the QuickStart Help File for new and existing users and to document the new example HotKey demo sets provided. More documentation is being prepared over the coming months. New WELCOME Program Log – a demo log with scheduled events over a 24-hour period demonstrates voice-tracking, dynamic HTML page generation, changes to the new GOTO TIME, CURRENT, NOW Macro and the way in which HotKeys can be used to easily navigate backwards and forwards through a daily Program Log. More information has been embedded into the supplied audio files to demonstrate some of the features. New GETWEATHER Module – Simian is now supplied with a custom written application to source the headline weather conditions using the domestic US Zipcode or International weather station code (c:\bsi32\apps). In both cases, the temperature can now be displayed in degrees Celsuis or Fahrenheit. Using a seperate application like this ensures that any network errors (or Internet blocking calls) have no impact on Simian. GOTO Macro – We have enhanced the behavior of this Macro to now allow the ability to step backwards through the log; and to make special provisions where a timed event has already been loaded into a play deck. GOTO TIME, CURRENT, NOW can now be used as the first item in a Program Log to take you to the correct Scheduled Time. New IGNOREINTRO Macro – Help -> Spyglass Diagnostics -> Expert provides the option to ignore the Intro of the next song and Always segue at previous Sec Tone (Ignore Intro). A new (hidden) Macro IGNOREINTRO OFF or IGNOREINTRO ON allows you to change that setting via scheduled events or in the Program Log. This can be used at different times of day when generic liners are used as positioners between songs where placing a Segue Marker (Sec Tone) close to the front of the liner, playback of the next song will be held back until the remaining audio in the liner is equal to or less than the intro of the next song and thus the liner will ‘hit the post’ each time. New HotKey Demos – a new demo set of HotKeys are installed into c:\bsi32\ – move these to your own HotKey folder to see other ways in which HotKeys can be used and managed. New Dynamic HTML Template – a new template.html page is installed in c:\bsi32 showing how to dynamically display a different CD cover (examples installed in c:\bsi32\images) each time a new song is played. Dynamic HTML Pages – numerous changes to the way in which information used to generate the dynamic HTML page is compiled have been introduced in this version of Simian, together with the way in which HTML elements can be encoded which is especially useful to customers using XML. (This is controlled by the Encode HTML in Program Options -> Internet tab). A previous reliance that the Category field in the Program Log was correct has been removed for HTML generation (this would always be correct if creating logs within Simian, but third-party scheduling tools used to generate logs may not correctly reflect the true category of the audio event and thus HTML excludes might not have worked for some users). We still recommend that the Category field is populated correctly and is in UPPER CASE for other features of Simian to work correctly. SERIALOPT Macro – in response to the way in which some users were using this Macro, in particular the way in which satellite receivers are being controlled, we have changed the behavior so that the case of the Macro parameters is now preserved and we have removed the restriction when using the comma symbol (universally used elsewhere within the Macro structure to delimit parameters). Changes to the way in which the optional port is opened and closed have also been made. HotKeys – During rapid HotKey use from the keyboard some users reached a point where subsequent keyboard presses would not work until a HotKey had been clicked with a mouse or touch-screen. Changes have now been made that will prevent this happening. TOOLS Menu – new options have been added to the main Menu allowing users to select the Record, HotKey, VoiceTrack and Mixer Panels previously only available on the panel mode buttons. Menu Changes – some minor changes to the Edit Menu to make navigation easier. VOICETRACK Editor – some users failed to remember to save an edited voice-track file before pressing the CTRL+V shortcut. Now, pressing CTRL+V will also save the voice-track file. TOOLTIPS – new graphics were added to some panels in Simian 1.7.0 which may have affected some users with visual impairments. We have now added standard Windows Tooltips to these buttons which may help customers using screen reading software. Simian 1.7 is a major update and will require new validation codes. These have already been mailed to eligible customers in the Domestic US. Customers that have purchased from International Dealers and have a valid Tech Care Plan should contact them directly for assistance. Updated Weather Module to retrieve data from US Zip Code, local filename and International Weather Station IDs. DECKVOLUME can now be set even if no item is currently playing in the deck. If no item is currently playing the volume will be applied to the next item to play in the deck. DECKVOLUME – removed restriction running this macro is the Async deck is busy. The macro itself no longer ties up the Async deck either. Allows you to ‘cross-fade’ between sources. IMPORT LOG – now supports the same meta variables as the CHAIN macro for automating importing of daily logs and selecting the import filter to use. See also the SORTLOGBYTIME Macro. INSERTLOG [.bsi program log]. The program log specified by LOGNAME will be inserted at the position of the INSERTLOG macro. PLAYASYNC [filename] plays file in the Async deck. This allows long-form programming to play from the Async deck, while spots / liners play from the main decks. RECORD – sent directly to the record engine to prevent other events in the Async deck delaying record start / stop. Also added new Macros for reviewing current recording. SERIAL – Added %LENGTH% meta-variable and added support for sending serial commands out of an additional serial port using the new SERIALOPT Macro. SORTLOGBYTIME – allows you to programmatically arrange the Program Log in the Chronological order of Scheduled Events times. For this to work properly, each Event must have a unique Scheduled Event time entered. TOPMOST [hidden] – restores keyboard input to Simian if another application has removed the Windows focus from Simian. New more extensive Macro documentation with Syntax, tips and examples is available from our Knowledge Base section. When entering Zone Codes for the Weather Forecasts (CTRL-W) the code is no longer case sensitive. If a current Weather Forecast is not available, Simian will no longer clear the contents of the existing forecast window – thus the latest available forecast will always be displayed. Added check for access to the Log file before writing, if auto update was set. Added new COMPACTHEAP Macro. This Macro (which can be run once a day as a Scheduled Event – no parameters are required) attempts to free up unused memory for Windows to use resulting in superior longevity. Our engineering test has lasted more than 150 days! Modified auto-update of Serial / Hotkey / Trigger and Scheduled sets which were being re-loaded every few seconds. This could cause a problem if the sets were being stored on a network machine which was no longer available. Also added protection against losing sets if access to the file is lost. Easier remote and “prior day” voice tracking, even with RCS Selector! Production licenses (where the main decks would not normally operate) will be upgraded to “Air Mode License” for duration of Tech Care Plan. These are designed to be used for ‘training’ and as a ‘Hot Standby’ use and (whilst capable) are NOT intended to run a full station which would fall outside the scope of the license agreement. Removed read of log on save. This caused the loss of status and continuity information in the current log. Introduced in 1.5.10. Added “Do not delete VT file when unloaded before paste” to SpyGlassExpert tab. Added SpyGlass Expert tag setting “Delay volume restore from auto mute”. This will delay the specified number of cycles before restoring the mixer volume to the preset level. Delays in deck loading for spots with little or no segue/intro times caused the mixer to pop up for a fraction of a second causing the sat feed to come through. Added RESETASYNC macro to clear the current and pending items in the Async Deck. Added OFF/ON option to the MIXVOLUME macro. Added support for <!–BSIALBUM–>, <!–BSIGENRE–> and <!–BSIPUBLISHER–> HTML meta-tags. Added SpyGlass No not replay same artist in random carts. Added MP3 capability to PLAYHOOKS. Will search for header.mp3, zinger.mp3 and tail.mp3 in the hooks folder. Added first four characters of the station id and session number, if not the first session, to the log file name. Added description to Record Macro. NONE modifier added to the LOADHOTKEYS macro. Updated InfoEdit. If InfoEdit is launched from a shortcut or stand-alone, a browsable file list is displayed. Deletes from EventBuidler audio list move to recycle bin. EventBuilder audio list refresh initiates a full SH refresh. Fixed EventBuilder audio list sort by date. If all options are selected the option “Hide file list” will not stay checked after a program restart. Fixed problem in Scheduled events, where, If all items are cut then paste does not work. Release notes pull up an old release note list, now pulls up new web Address. Text/tag does not appear to work correctly. The text files show up in the list but error when placed in the log. Also delete button does not delete the file. Status: Fixed. Video does not delete with delete button Status: Fixed. Empty EventBuilder at startup when audio.mdb has been deleted. Fixed a problem with Soundhound mode setting when playing carts. Added Folder Change Notification Filter configuration to SoundHound. Displayed the correct amount of relays on the relay rack. Fixed a problem with serials being disabled if there is no set specified on startup. Added Hide Scrubbers to Program Options. Fixed anomalous space bar behavior. EventBuilder delete from audio list now moves to recycle bin for local files. EventBuilder refresh does a full SoundHound refresh. Fixed EventBuilder sort by date. Throw errors on failed deleting (text/video) from eventbuilder instead of doing nothing. Fixed an indexing issue in scheduled events setup that prevented pasting when the events had been cut out. Fixed deleted audio.mdb causes empty audio list. Added autoscrolling to main grid. Separated Options Form into two separate forms. Added “Display Backtime To Mark” option in Log menu. Allows users to set a backtime event and scheduled time from event builder. It then shows the actual time until mark (TTM) and the amount of data remaining until mark (DR) as well as the difference between the two. Added MP3 Support to Saytime. Fixed Problem in Event Builder preventing EB from viewing an unfiltered list after canceling the filter. Fixed an error that would not allow serials to be used (on startup) unless a serial set was designated. Fixed Autostep Que notation when using Quick Insert. Fixed Callback Trigger method to utilize Audioscience’s V2.67 Driver fix. Fixed Cue designation on Quick insert form. Changed the event log list to display newest first. Added Tooltip text to voicetrack editor. Added code to prevent relaunch on shutdown. Fixed Security code to correctly validate app based on version. Fixed Dropout to Production mode. Added support for new method (more reliable) of ASI trigger handling. Removed Graphical error in Async Deck. Added update to folder list when Audio Database is changed. Attempted logic fix for Record deck VU meter display. Added a ‘Confirm Delete’ Dialog when deleting user security settings. Added ‘Save Changes’ Dialog to security options. Added a way to launch EventBuilder from the autoreplace form. Set Soundhound to manual mode when eventbuilder is open. This prevents the audiolist from jumping. Corrected Trigger editor index problem (one short on all sets). Prevented Autoscrolling when event builder is open. Delayed Eventbuilder load call to prevent lockup on virgin systems. Rewrote “Display Runtime” calculation routine for quicker results. Changed the Deck Cue information to the Number column in the event log. Prevented Eventbuilder from automatically refreshing when soundhound updates. Removed Timed events from quick insert as there is no way to specify time. Turned Trigger display lights back on. Fixed Trigger issues with ASI cards. Prevented Eventbuilder from scrolling past last item in database. Fixed issue that caused the grid to dissappear when using pageup/down consecutively. Fixed dissappearing grid when autoscrolling and adding multiple events at the bottom of the log. Fixed dissappearing grid when left for extended periods. Refined autoscroll behavior, now only scrolls when mouse X coordinate is trapped within that of the grid. Also prevent autoscrolling when Cartviewer is open. Changed grid columns to sizeable again. Prevented the creation of duplicate categories. Changed Syntax error in recordsource Macro. Statusbar now updates when “None” is selected in trigger setup. Statusbar updates when Loadtriggers macro is used. Serial display on statusbar now displays the serial set loaded. Fixed a Mathematical error in the function used to convert milliseconds to “00:00:00” format. Changed InfoEdit launch routine to launch from the directory it’s installed to. Fixed Security Issue that reads user specific settings when user is changed/modified. Security – Hide hardware options now works. Removed code that stops playback when the copy button is used. Made Validation Code not case sensitive. Fixed dragdrop placement resolution issue in main grid (direct replacement). Fixed the scrolling errors in the main grid with scrollbar. Fixed MoveUp/MoveDown To autoposition in center of grid and scroll around selected item. Recording VU Meter Assignment for a Zero (device ID) displays correctly. Fixed Display of statusbar to correctly reflect whether the audiolist is visible. IMPORTANT NOTICE: YOU WILL NEED A BSI USB SECURITY KEY IN ORDER TO RUN THIS VERSION OF SIMIAN IN ANYTHING OTHER THAN DEMONSTRATION MODE. IF YOU HAVE PURCHASED SIMIAN AND HAVE NOT RECEIVED A USB SECURITY KEY AND CD, PLEASE CONTACT BSI PROMPTLY. ALL PREVIOUS VERSIONS OF SIMIAN WILL EXPIRE ON DECEMBER 1, 2001. Added pitch shift & backtime capability. Global setting in OPTIONS. Individual setting on deck right-click. Replaced BUILDHOOKSCART & PLAYHOOKSCART macros with PLAYHOOKS macro.